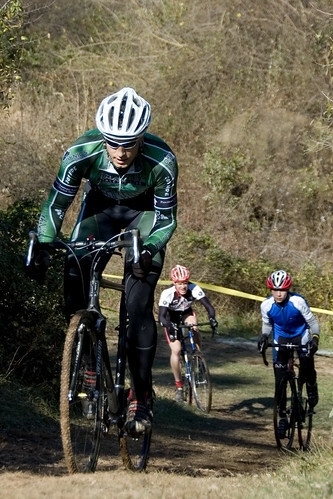 The Mid-Atlantic cyclocross scene visited Leesburg, Virginia November 23 for Squadra Coppi’s Tacchino Ciclocross. Racers were treated to crisp conditions and a challenging course. We got some great responses for this race. If you want to know how the top racers in the Mid-Atlantic take care of business, keep on reading. Here are my takeaways: (1) suitcases of sausage are good … even for vegetarians, (2) first time on this site we have admitted sandbaggers … I like that, (3) also for the first time we got actual stock tips [disclaimer: I am not offering advice, just reporting] , and (4) whether it’s his clients or his own performance … Kris Auer seems to know something about this cyclocross thing. I would love to know what folks think about the site. Take a second and leave a comment.